It has been suggested that Banavie is one of the possible birth places of Saint Patrick. One theory is that Patrick was the son of a Roman tax collector and born at Banavie around AD 389. His family had come with the Romans who had invaded the West Highlands and Islands. The 19th century work 'History of Celtic Placenames' by William J. Watson notes: "St Patrick was born at Banna-venta, an early town south of the Grampians." A similar placename, Bannavem Taburniae, is mentioned in one of the only two known authenticated letters by St Patrick. It was formerly where the Camanachd Association, the ruling body of shinty was based, but this has now been moved to Inverness. Banavie railway station is on the highly scenic West Highland Line. The signalling centre at the station uses radio communications to control train movements on the West Highland Line. It covers a big area from Fort William to Mallaig and from Fort William to Helensburgh including the branch line to Oban. The Caledonian Canal passes through Banavie, before ascending Neptune's Staircase, the longest staircase lock in the United Kingdom. The canal is crossed by two swing bridges, one carrying the railway and the other the A835 road. Banavie Pier railway station served the canal paddle steamers until 1939. The station building, platform and station master's house still survive as private dwellings. The village has a number of bed and breakfast, guesthouses, self-catering and hotels. The scenery around Banavie is exceptional with Ben Nevis dominant in the skyline. The Caledonian Canal passes through the village at Neptune's Staircase, which is a set of lock gates that raise vessels into Banavie upper canal area which has a long pontoon for visiting boats and yachts. The Great Glen Way long distance path also passes through the village, mostly following the canal tow-path to Gairlochy. ^ Microsoft; Nokia (20 April 2017). 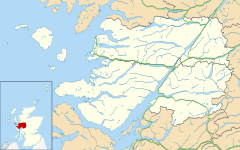 "Banavie" (Map). Bing Maps. Microsoft. Retrieved 20 April 2017. ^ "The Confessio of Saint Patrick". ccel.org. Retrieved 2015-01-03.